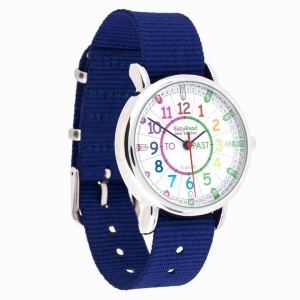 "My daughter is 9 years old and has dyslexia and the watch I ordered from your site has allowed her for the first time to read the time like her classmates and made such a significant difference to her life"
EasyRead Time Teacher's simple 3-step teaching system really works. Step 1: Read the number at the end of the long hand. 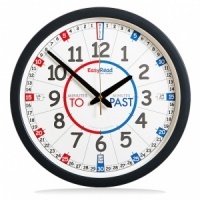 Step 2: Say which side the long hand is on: 'minutes past' or 'minutes to'. Step 3: Read the number at the end of the short hand. 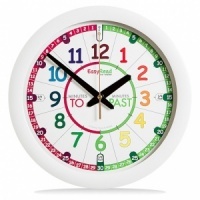 Like this - '9 minutes to 2'. 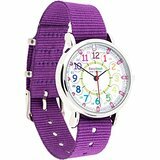 EasyRead Time Teacher children's watch, 33 mm diameter, with multi-coloured face, a choice of Purple or Navy fabric strap and metal buckle. 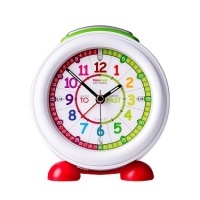 Designed to help children learn to tell the time in terms of 'minutes past' and 'minutes to' the hour. 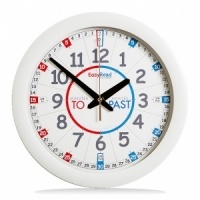 Supplied with simple 3-step teaching system instructions, easy to learn, compatible with EasyRead Time Teacher clocks. Washable fabric strap, 15 mm wide by 21.5 cm long. 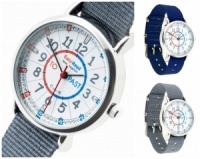 Fits wrists from 12 cm to 18 cm circumference (small child to medium adult). 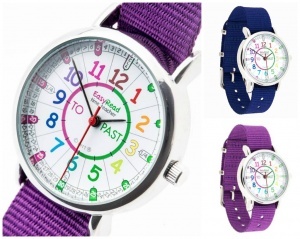 A great looking watch for teaching the time... Now available with PURPLE or NAVY Strap.